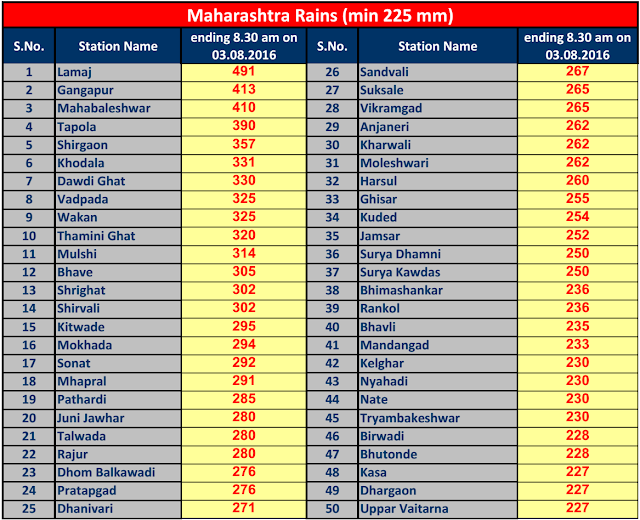 Lamaj the wettest place of Maharashtra for past few years posted the highest 24hrs rainfall this year. The deluge continues in ghat and catchment areas of Krishna and Godavari basin....From Pradeep. Lakes supplying water to Mumbai are today 91% full...That is Storage at 13.31 Mcum. Mumbai now has water storage till 10th July 2017.Comfortable Position ! 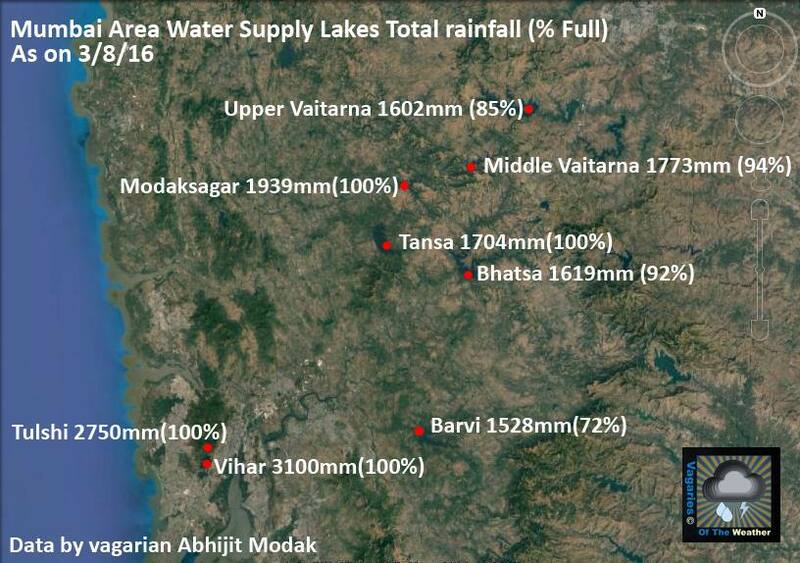 Total Rainfall in Various Lakes on Map (compiled by Vagarian Tejas). Latest on the Rainfall Position of Navi Mumbai and surrounding towns ( From Vagarian Abhijit Modak). 2nd August/3rd August:A Bridge was washed away due to heavy rains on the Mumbai-Goa Highway. Incessant rains last 2 days have caused major overflowing of rivers and rivulets. 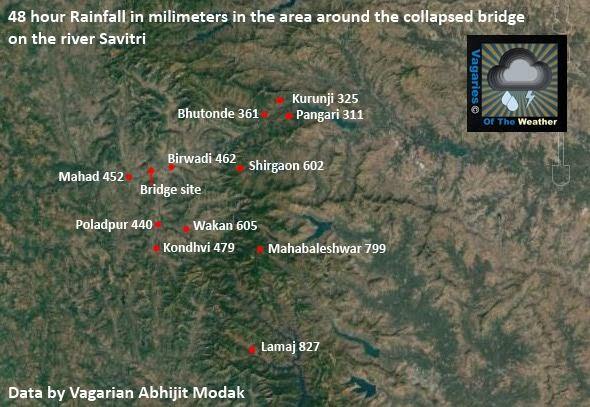 Vagarian Tejas hahs prepared a map of the rainfall in last 48 hrs around the Bridge Collapse site.We can judge the amount of rain from this ! Very informative. As a past resident of Navi Mumbai, was keen on knowing the RF figures till date. Thanks Abhijit for the timely update. Raining information precise accurate and blog remains updated as always been. All international climate models surveyed by the Bureau indicate the negative IOD will persist until the end of spring, which historically has brought increased rainfall to southern Australia. Sea surface temperatures have cooled slightly in the tropical Pacific over the past fortnight. Some atmospheric indicators have shifted slightly towards La Niña thresholds, but all remain within neutral bounds. May to July 2016 was Australia's third-wettest May–July on record. During negative IOD events, southern Australia typically experiences above average winter–spring rainfall and cooler than average daytime temperatures, with warmer daytime and night-time temperatures in northern Australia. Bucketing it down in south-Central Mumbai since Morning. From where one could get levels of Dams in and around Pune? Some serious rains happening in Mumbai .. No mention in vagaries ?? All blogs, IMD forecast extreme rains over Mumbai - raining torrential over Navi Mumbai- IMD says to stay safe - alert - but vagaries has not given this forecast why? 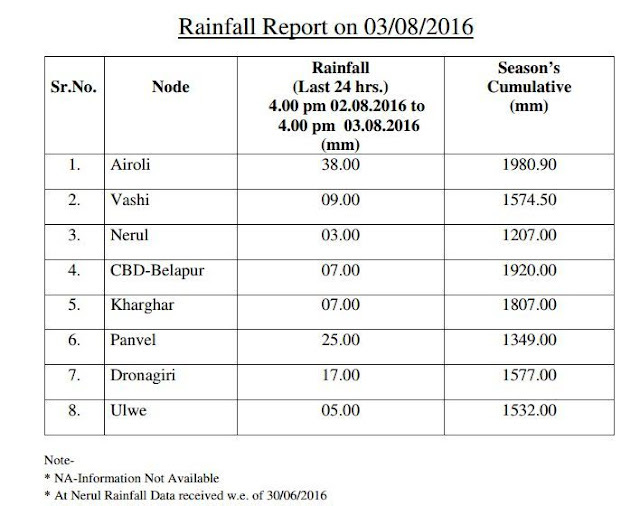 Figures Taken from vagaries blog - 2015 end monsoon report (june - sept) . Leaving apart top 3 places (Meghalaya sates) - rest from position 4. Figures ranging from 5000mm below... If we see Harnai,Mahabaleshwar...konkan places, ghat areas of MAHA these figures have already in 2 months (june-july)... another 2 months to go these places may rewrite history for wettest spots (2016 2 times 2015). 3.Cherrapunji RKM, Meghalaya - N.A. Surprisingly vagaries are silent for for last few days. we depend so heavily on blog to determine our plans. Rajesh Sir please give us your valued advice. 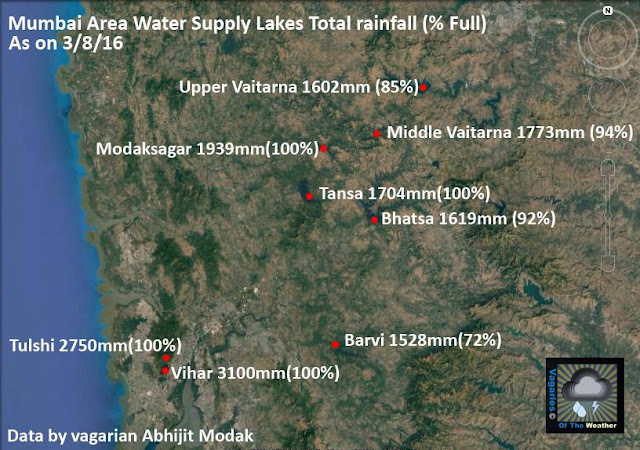 sanjeev gokhale: Vagaries is giving the latest rain figures and the latest with maps. The information is published much before it is seen anywhere.In fact a lot of collective info is fed by our team as quickly as possible to keep readers updated. And all in one blog, all information avalaible in one site. Please tell us why you think it is silent ? sset: Vagaries was busy giving a lot of other info. Was intending to put up forecast on Friday. And please tell us which other blog had pre warned of this Mumbai downpour ? IMD gave the warning late morning after 50 mms had already fallen. Thanks to both for the ultimate faith in Vagaries. + I hope you have been seeing the "Flash Snippets" which are updated with the latest regularly as and when. 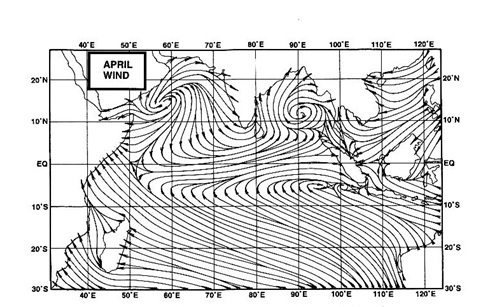 The monsoon and the Western Disturbance are the two main factors which alter the weather over Karachi; otherwise, Continental air prevails for rest of the year. Following are the main factors that affect the weather over Karachi city.